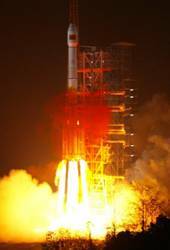 The satellite is the first of 10 that China has previously announced it plans to launch over the next year and a half. The second “Compass” satellite was developed by the China Academy of Space Technology, which is part of the China Aerospace Science and Technology Corporation. An April 17 news report by Xinhua, quoted Cao Chong, chief engineer of the China Electronics Technology Group Corporation, as estimating that the first phase of Compass, scheduled to complete a regional capability by the end next year, would cost more than US$1.463 billion. “I think the Compass system might cost China several dozen billion yuan," said Cao, who works with the China Satellite Navigation Engineering Center responsible for building the Compass system. “The first phase alone could cost more than 10 billion yuan,” Cao said. 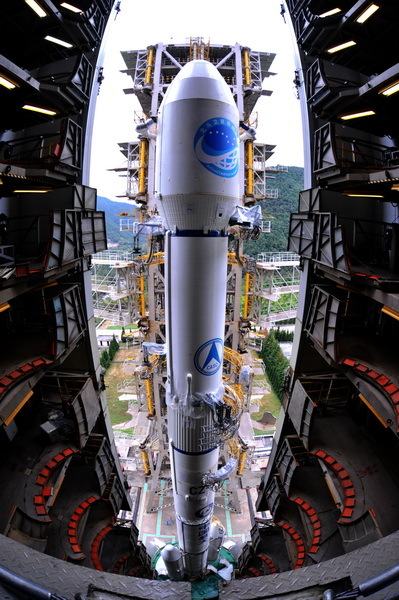 Although the news reports characterized the most recent launch as the second Compass (Beidou-2) satellite, some reports suggest that a geostationary satellite launched February 3, 2007, and stationed at 58.75º E, will also be part of the system. China launched its first Compass middle-earth-orbiting (MEO) satellite in April 2007, joining several geostationary Beidou-1 satellites that have been launched since 2000. In contrast, BeiDou-1 is based on active two-way transmissions between the user and the central control station via the system’s geostationary satellites, similar to the radiodetermination satellite service (RSS) provided by the Geostar Corporation and successor U.S. systems in the 1990s. The Beidou-1 technology requires the central control station polls the users via two satellites. When the central station receives the responding signals from the user equipment, it calculates the user’s two-dimensional position based on the time difference between the two signals. Beidou-1 has been operating for five years and played an important role in the rescue work after the May 12 earthquake in Sichuan province last year. Beidou-1 has more than 40,000 registered customers, with an expected 60,000 more to join in a couple of years, according to Zhao Kangning, deputy director of China’s satellite navigation application management center. China has applied to the International Telecommunications Union (ITU) for priority use of several bands in which Europe’s Galileo program has planned to transmit its encrypted Public Regulated Service (PRS) signals for potential use in public safety, security, and military applications. As currently proposed, Compass signals would occupy/overlay part or all of inteded PRS frequencies, including Compass B1 at 1559-1563 MHZ (overlaying lower part of Galileo E1A), Compass B1-2 at 1587–1591 (overlaying part of upper Galileo E1), and B3, a 24 MHz bandwidth centered at 1268.52 (overlaying a portion of Galileo E6).